Turns out my dogs do know sit. About two years ago, I wrote a post called, “My Dogs Don’t Know Sit!”. 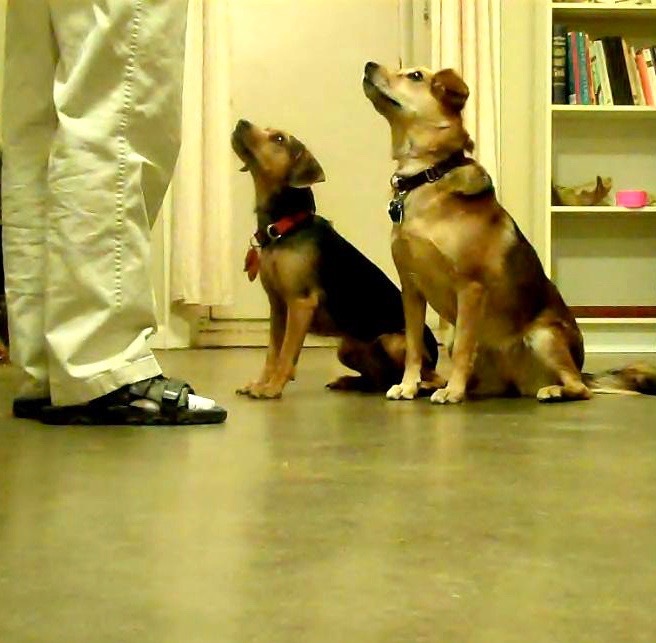 I described how my dogs couldn’t hold a sit stay when I stood still right in front of them. I analyzed the problem, and my conclusion was that part of the cue for them to stay was actually my walking away from them. This was probably because I added distance too soon when originally training the stay. I ended up with the perverse situation that my dogs would hold their stays if I walked around, jogged, dropped treats, or left the room, but not if I stood still. All three of them responded this way, so it was clear that I was the problem. I kept letting it slide, because in real life, I’m almost always moving around when I need them to stay. But I’ve been rather embarrassed about our sit stay problem, and that little hole in our training has bugged me. So, the other day I decided to take the plunge. For duration behaviors, I pick a visual target for myself other than the dog’s face. If I make eye contact, I’m likely going to ask the dog to do something. That’s what they are ready for. So try looking at the wall behind the dog. Not the dog. Marge always gives good advice. I did a session that very day with both Zani and Clara. I tried out Marge’s suggestion, thinking I would be able to use it to at least jump-start work on the sit stay. But they both flawlessly held the sit stay for as long as I wanted the very first time, and I was standing still right in front of them! And that’s even though we were on a small rug, which is a strong environmental cue to do a down instead of a sit. I pointedly looked at the wall behind them (that’s why I look dopey in the photo), and they both held their sits like little statues. Wow. It turns out looking at my dogs was a cue for them to offer behaviors. Who knew? (Besides Marge.) I was the problem, but for once there was an easy fix. Look somewhere else, Eileen! I still agree with what I wrote in the previous blog. But it was incomplete. I realized at the time (two years ago, by the way) that moving away was part of the cue for them to stay. I didn’t realize that looking at their faces when I stood still was a cue for them to move! Even though that’s exactly what I do when shaping or in other situations when I want them to offer behavior. Here’s a quick comparison with both Zani and Clara. The movie shows the differences in their behavior when I look at them versus when I look at the wall. Somebody is bound to mention that if I just added a separate verbal “stay” cue, I wouldn’t have this problem. Perhaps, but I’d rather just use my original verbal cue. There’s no reason a single positional cue can’t have a “stay” built into it. I already have good down stays, mat stays, and even stands trained that way. 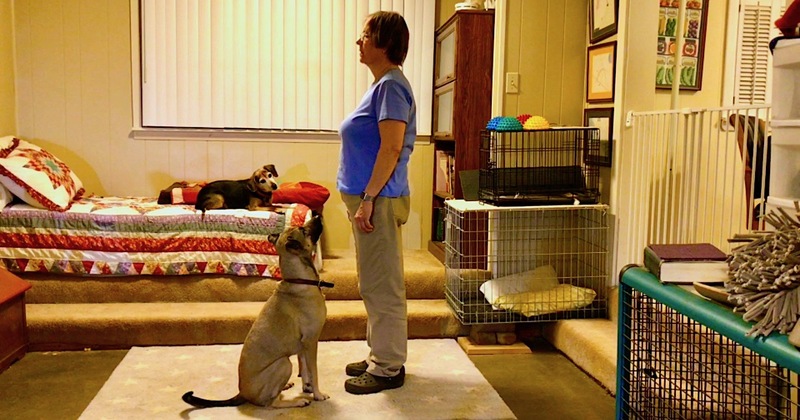 The problem I have with the sit stay is well analyzed (thanks to Marge) and fixable. I don’t want my sloppy training to be used as an argument for needing a stay cue. Lots of people do without it just fine. The difference: they are clear about criteria. Speaking of criteria, I have a decision to make. Am I OK with the cue situation as it stands? I could say, “Yay, my dogs can sit, they have duration, I just need to remember not to stare at them.” Or I could decide that they need to be able to stay even when I look at them. There is no right or wrong answer to that, although I bet most professional trainers and dog sport competitors would choose the latter and “proof” their dogs to hold a stay even when being stared at. But it’s also valid to let the handler’s duration “expectant look” mean, “Please offer some behavior.” I get to decide and train accordingly. I need to remember to be fair to my dogs and be consistent with my criteria. Since Marge knew about the visual target thing, I’m guessing there are others like me who are simultaneously asking their dogs to stay and cuing them to move. I hope this advice can help some others. It worked a charm for me!